For a simple manmade tool, umbrellas are a strangely photogenic. In their own small way, they show the constant human struggle with nature. While we cannot dominate the weather, this relatively simple design protects us from the elements, including the sun. In a city famous for building into the sky, Chicago cannot escape the oppressive heat and humidity at street level. And yet, an umbrella is this woman's proverbial ace up the sleeve, reminding us of a narrow but meaningful edge we sometimes maintain over the Earth. 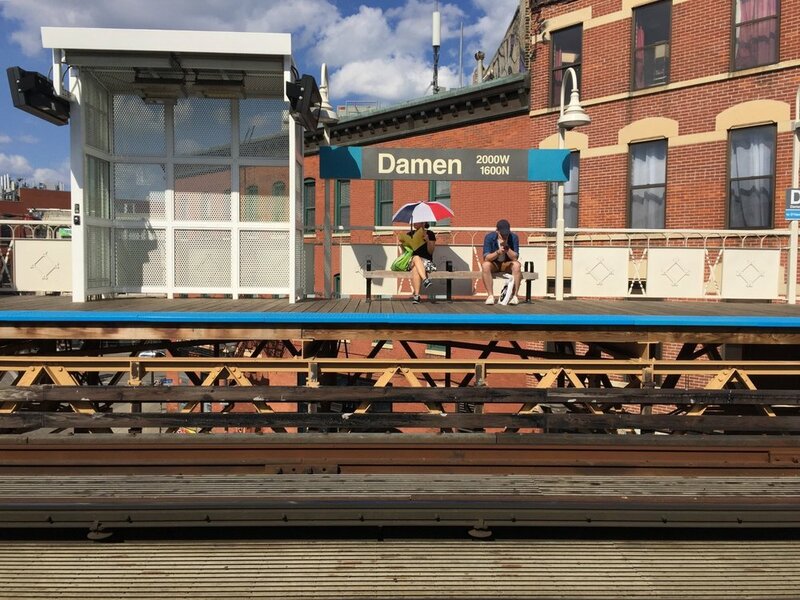 The umbrella defense is a common tactic around Japan and East Asia, similarly sunny and humid as Chicago where it is far less commonly deployed. The scene above (and below) is not an everyday occurrence for a roaming street shooter in Chicago; in Tokyo, however, it’s so common that the mere novelty to a Westerner is quickly lost, requiring a deeper take on their presence. While I think the usage is pragmatically genius to improve one’s comfort, there’s a nuanced racial component for some who apply SPF Umbrella. I’m sure most solely aim to reduce the temperature and prevent damage, but many are also avoiding the subsequent tanning effects of the sun as much as they are immediate heating effects. Many women (the predominant employers of such sun avoidance) went beyond the umbrella by wearing removable sleeves and head/face scarves to avoid any possible tanning (presumably, otherwise the additional clothing would prove counterproductive to increasing comfort)*. I had numerous encounters with individuals wearing these garments, but unfortunately, I failed to take an interesting photo of any of them. *Note: This is not to say anyone is entirely or partially motivated by racism in their usage of umbrellas or protective garments, or that they are racially motivated in other dimensions of life; but it is at some level related to a preference for lighter colored skin. In any case, I'm willing to presume such occurrences likely reflect low-stakes considerations for skin tone and probably do not bear highly consequential moral outcomes (i.e. this isn't a big deal unless it's causing others' suffering). As a total outsider, I simply don’t know; this is merely an observation. Instead, I focused primarily on interesting graphical representations that juxtaposed umbrellas with their context in Tokyo’s streets: the ornate details in the fancy lacing against the graffiti and stickers on the staircase (above); the water stains on the wall invoking a storm over pedestrians’ heads in otherwise sunny conditions (below); an elegantly posed woman in a black dress protected by her white umbrella next to a man in a standard black pants-white shirt-no umbrella business uniform. My graduate studies in international relations emphasized the importance of cultural differences to explain human behavior around the world, differences that function alongside many other factors. Traveling allows us to experience these differences firsthand and (usually) leaves travelers with a sense not only of others’ cultures but of their own culture as well. It’s very hard to see or feel what makes me American while I’m in the US among others behaving similarly to me; placing me in the center of Japan brings those differences to the surface immediately. Whether a simple utility or a harbinger of racial preferences, using an umbrella as protection from the sun - if bearing no other meaning or consequence in the world - at the very least makes my job more interesting. Photographing others’ behavior forces me to think deeply about it with the added benefit of preserving the cross-cultural experience forever.